Triathlon is still gaining more and more attention, even during my holidays in China I was approached for a street-interview in Shanghai! But honestly, besides these 5 minutes I almost didn't think of triathlon in the past 2 weeks since IM Arizona. Had a good time with Rob in China and almost didn't do any training. Next week will be my 3rd week off, and after that I will start some basic training again to keep my body in shape. Building to the 2011 season can wait until January. But today I did write my traditional 2010 season review, which I would like to share with you (see link below). Summarized, I am very happy reaching top-level again after 100% recovery of the injury season 2009. And I really am pleased with my best Kona result ever. It seems that I will be in 9th position on the new Ironman World Ranking at the end of this year, so the first steps to Kona 2011 have been made. I really would like to thank all my sponsors for their continuous support and belief. Best and sportive regards, Heleen. Just another day in the office. This year, Ironman Arizona was a though race. The weather conditions were not easy, a lot of winds and some rain. I would say, dutch weather! Not Arizona weather what you would expect. And the field was very strong and deep. 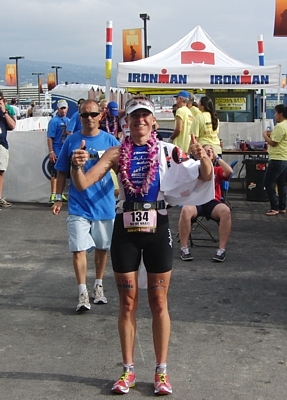 Before the race, I knew that I didn't have the form I had in Kona. But I was excited to race, and would love to feel the pain of racing again. So I went in to it to give it all. My swim again was not terrific. The group I swam in had a pace which was a little to easy for me. But I had not the power to go in front, so I just followed. On the bike I pushed as hard as I could. The first 120 km were ok, but in the last 60 km I lost 5 minutes because of pain in my lower back. I didn't have the power any more to push. So instead of riding a sub 5 hour bike split I was 4 minutes over it. During the run I struggled with pain in my legs. But I kept telling myself: keep rythm. And so I did. I ended up in 8th place, behind some other great names in the sport. I"m happy with it. Two top races for me within 6 weeks is just a little bit too much. Hawaii went top, and this one was ok. Now its time for some rest. What a great race! It's two weeks ago now, that I raced the World Championships in Hawaii. The weeks before the race I felt already great. I was ready to race and give my best. And that was exactly what I did. The swim wasn't ok, but well I saved a lot of energy by swimming not that fast in this group of girls! So I had enough left to cycle and run as fast as I could. I came out of the water in 47th spot. Started the bike part and everything went very smooth, except from loosing a nutrition bottle. But I felt relaxed and focused on my race plan. A good pace to Hawi and started to push the pedals even more on my way back from Hawi. If you look to the splits, you can see the second part was better compared to the other girls, exactly as we wanted it to be. This resulted in coming off the bike in 18th spot. The first km's during the run felt awful, but I knew that I would find my rythm. When running up Palani Road after 15 km's of running, I was already in 12th spot and Rob told me some of the girls ahead of me started to fade. Although the gaps were several minutes large, I knew from that point that it was my chance to finish top 10. Just keep running, keep your pace. Palani Road again, and I could catch 2 more girls which put me in 8th for a very short time, as Caitlin Snow passed me in her blistering 2.56 speed before I could get to the finishline. So I ended up at 9th place and I'm very happy that I reached my goal finishing top 10! At the moment I'm back in the Netherlands. Still recovering from the race and will pick up training seriously by next week. I will stay here for only 3 weeks and then I will leave to the US again for my last race of this season: IM Arizona! I would like to thank all my sponsors. Without you it is almost impossible to reach this goal. Thanks for all your support. 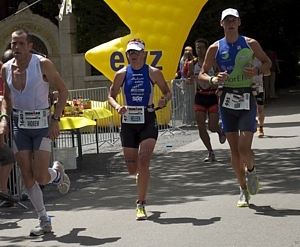 After Ironman Switzerland I had two easy weeks to recover from the race and charge the battery again. I made also plans for the road to Kona. Now it is already half way so it's time to tell you what I did and what is coming up. September the 5th was the first stop. 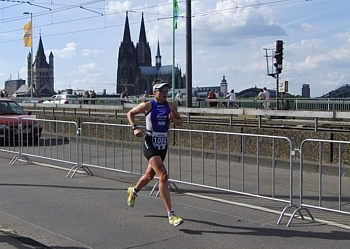 I participated in the Cologne Half in Germany. 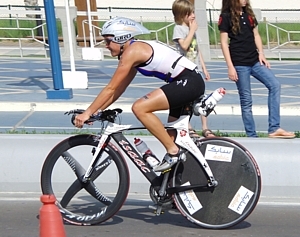 It was a race with over 2000 triathletes which resulted in a very busy bike course. Unfortunately I got my first time penalty so far in my whole career. Me, the one who hates drafting that much! This held me of from the third place and I finished fourth in this race. The day after the race I flew to the Sierra Nevada in Spain, for the second time this year. At the moment I'm still there at altitude and doing my last preparation for IM Hawaii. I'm feeling great and everything is going well. Of course sometimes I'm tired from the hard training sessions, but I feel that I'm getting better. After this trainingcamp I'm flying via The Netherlands to Kona. Finally I am really back into Ironman racing! Yesterday was my first finish in an Ironman since more than one and a half year ago (my victory in IM Arizona). Happily I could maintain my good shape of 5 weeks ago in Stein. With a solid race I could move up into 2nd position at the finishline. I had a good feeling in the water and am happy with my result, especially if compared to the other girls as most swim-times were on the slow side. The bike was not as good as in Stein yesterday. I had in mind to be about 5 to 10 minutes faster on this course, but the legs were painful and I really had to push hard all the time to move up a little in the field. But again I proved myself that off-the-bike I can run well, even with sore legs. My feeling about the 3.07 marathon is that I still can improve, especially given the fact that we have been quite precautious in my running training last half year (about 60 to 70 km/week) after last years' injury-season. But even with a slightly better race I still would have been placed 2nd. 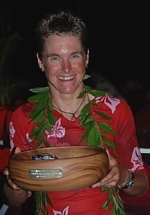 Former cyclist and time-trial World Champion Karin Thürig was riding an amazing bike split and ran a very good 3.04 marathon. If she can maintain or improve this level towards Hawaii, she definitely will be in the mix for a top spot in Kona. Talking about Hawaii: also my qualification is done now, so I can focus on my preparation in coming 11 weeks. Wow, what a great feeling. My third victory in Stein, Dutch champion, far below the previous course record in my home-town race. But it was not easy, I had to dig deep in this exciting race. The other 3 top competitors Tereza, Sonja and Eva pushed me towards this performance. I think this is my most beautiful victory in Stein. And also proved myself I could return to my previous level (or better) after the disastrous injury season 2009. Think I will enjoy my recovery this week more than ever! After the Abu Dhabi triathlon I went home, got some rest and started my training in The Netherlands again. Luckily the weather was good and some days we had really nice and warm days with 20 degrees Celsius. 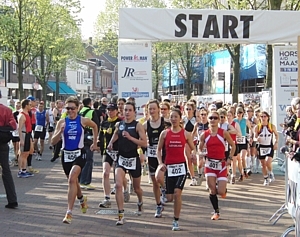 My next important race would be the Powerman European Championships in Horst, The Netherlands. To get some more speed I did some short races. Two weeks ago I did a short duatlon (5-22-2,5) which I won. I did also a 10 km road run race and a 40 km bike time trial. I felt really good and was ready for the Powerman. The distance is a 15 km run, a 60 km bikeride and again a 7,5 km run. We started at 9 o'clock in the morning. It was a very nice day and the temperature should reach 23 degrees during the day. I knew before hand that I would loose about 3 minutes during the first run. That was wat happened and I started the bike part after 58:28 minutes in 5th place. But unfortunedly I didn't have the bike legs which I had the last weeks. My legs felt so bad that it was hard to put the power on the bike. But I tried to push all the way and after 20-30 km it felt a little bit better. But by that time I lost already too much time to reach my goals which I had beforehand: to finish on the podium and to become the dutch champion. We came off the bike with 3 girls together in 2nd, 3rd and 4th place. I tried the best I could but knew the others would have more run-speed. 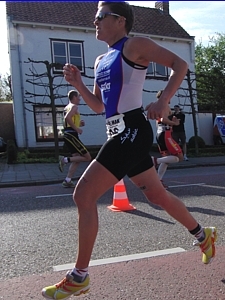 I finished 4th place overall and was 2nd in the dutch championships. It were only 13 seconds, otherwise I had reached my goals. So I'm not completely satisfied, but well if I had the bike legs from last weeks it was possible. That at least is the good part of it: I know my fitness level is improving and I am already faster than I was in Abu Dhabi. 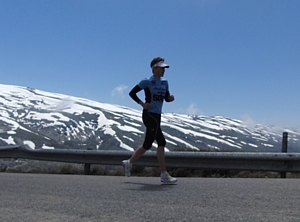 Now I will take a small rest period and than I will go for 2 weeks on high altitude trainingscamp to the Sierra Nevada in the Southern part of Spain to prepare for the long distance tri-races this summer. Since my last update in January, I have trained a couple of weeks in South-Africa to rebuild base endurance and did a nice trainingcamp on Spanish Lanzarote to prepare for the first long distance race of the year in Abu Dhabi. That was last weekend and I am happy also having finished this race without any problems. The only remaining issue is my level compared to the worldclass athletes competing in the race, but that's a matter of time, patience, more training and some races to improve. 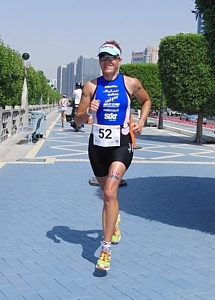 When I arrived in the UAE I first had some training-days in a smaller city called Al Ain, near to the Oman border. This was since they told us cycling is almost impossible in Abu Dhabi itself, which is true. So I was glad to train in this resort with a 33m pool and in nice hot weather. On Thursday a taxi drove me to Abu Dhabi, where we stayed in the Hilton very close to the race venue. Friday we checked out the swim course, which was perfect for me with salt water and no waves. We also drove the cycling course in the car (together with other Dutch elite athlete Irene Kinnegim and her husband). It was great, they closed a 5-lane highway and we had to do 2 loops on the brandnew Formula-1 circuit, which was really cool! The course was flat with only slight elevations to keep you out of the aerobars. A very special course of 80km, we had to do 2,5 loops and I was really looking forward to it. The race was about to start at 6.20 in the early morning, but this was postponed on race morning because the police could not garuantee a fully empty highway yet. Twentyfive minutes later the gun went off and 27 women started 1 minute later than the elite men. The field was really strong and everyone was talking about the strongest field ever besides the yearly IM Hawaii. Of course the prize money had to do something with that. Another reason that so many PRO athletes gathered in the early season is the fact that the distance really suits the early preparation phase. For myself it was ideal, I did not feel ready for the marathon yet, but a 200k bike followed by a 20k run was an excellent test opportunity. We know my swim is slow, but for me it was not a bad day. I could save some energy by swimming together with another girl and I felt good in my fast Sailfish speedsuit. And with 200k on the bike a lot can happen: almost 5 and a half hour in the aerobars! I tried to push during the full bike leg, but noticed that I still lack some power to ride the same speed as the front of the field. They rode about 37-38 km/h and my speed was about 36 km/h. It was better than in South-Africa though, since I could hold the same speed until the last 20km this time. But at the start of the run I only could focus on a good run result for myself, the gaps were too large to go for top-10. 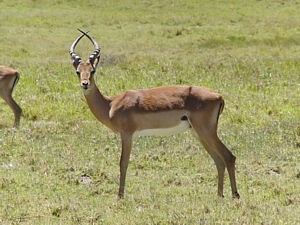 Also the run was better than in South-Africa and that is what made me happy. I classified 17th in the end, not very satisfying, but I have to take it as it is at the moment. Although I am not there yet, I can clearly see the progress and have the confidence I will be back within a few months / races. And I will not forget this race was a really great experience. Two weeks ago we left the cold winter in Holland and arrived in sunny South-Africa. We stayed with our friends Joost and Anita in Port-Elizabeth (PE) for a few days and did some sessions on the IM course. Last weekend we moved to East-London, just a 3 hour drive from PE. Swimming in the sea with some waves is always difficult for me, so we practised on the course a few times. The race would be my first in half a year after being fully recovered from my back-injury now, so I was excited to participate. My cycling should be OK, I thought upfront, but some doubts were there since last 6 weeks I almost only trained indoors (and that's different!). For the run, I just hoped to be able to finish in a reasonable time and without any problems. But of course when you are racing again, you also want to be a serious candidate for top-3, and that was what I was hoping for. After fighting the waves, I found myself with the same 8 minute gap as last year to leader and fast swimmer Lucie Zelenkova, and only 3 to Sandra Wallenhorst. The first 45k on the bike went quite well and with this though bike-course there were chances to overtake a few ladies in the second half on our way back to East-London. However, here it showed up that it was only my first race in a while. I faded a little bit rather than continue to power and speed-up. Starting the run, I only was in 7th position and the gap to the podium still was too large. Also my run was not of the level I had hoped before, but you can't say it was bad either. Just some steps of improvement to make in the next couple of weeks, and I think I will need a couple of these kind of races to get back to my previous level again. The first step will be taken right now. After the race we flew to Jo'burg. Rob went back home and I drove to Potchefstroom, where I am staying with our South-African friends Cor and Ditri and training with Dutch PRO's Sander and Birgit Berk. Way better than returning to the European winter! 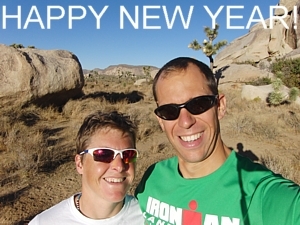 A happy new year to all of you! After my first race in half a year yesterday-evening, I really look forward to 2010. And I did already some planning so can mention you my next races. The first one is (same as last year) the IM70.3 (half Ironman) in South-Africa on January 17th. After the race I will stay in that nice climate for 4 weeks to prevent a lot of indoor cycling in Holland (it's freezing out here now, and we have snow from time to time). 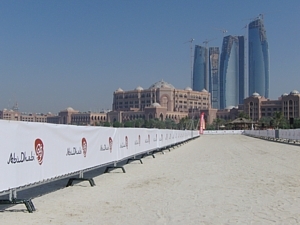 Then on March 13th I will participate in the new long distance race in Abu Dhabi. Seems a nice adventure to me and the distances (a long bike leg of 200km and a not too long run of 20km) suit my training schedule very well at the moment. Because on the bike things go quite well and due to my past injuries in 2009 I am still working on my run. That's also the reason I did not plan my first full distance Ironman race yet, because I have to see first when I feel ready for the marathon. Two other races on my schedule are both top-races in my home-province Limburg: the Powerman EC in Horst a/d Maas and the SABIC LD Triathlon in home-town Stein. When things go well, I hope to add some others, but first wait and see. For those who love pics, we added some of the 2009 season on my photo-page. The last day of the year there always is the traditional 10k run in Elsloo, a small village near our hometown Stein. A nice atmosphere in the dark evening with some snow. A few years ago I set my PB on this course, but this year I had another goal. At first I was very happy I finally could participate in a race, because my last one was in July (Alpe d'Huez triathlon). I was not very sure about my level on the run. I only run without pain for 6 weeks now and did not too much speedwork up till now. So my goal was to run smooth and finish in about 40 minutes. The first 5k I watched my style and was happy with that. The second part my hamstings let me know that they were not used to this tempo in cold weather, but I was quite happy about my endurance ability. I could keep the same pace and finished in 39 minutes and 40 seconds. Not great, but very satisfactory for this moment. I know I can make quite some progress the next couple of weeks and months. Most important for me this season is staying injury-free, so rushing is a mistake I don't want to make. And the positive thing is that if you can keep us this pace, it already results in a nice half marathon time. That's what I have to do middle of January in the South-Africa 70.3!